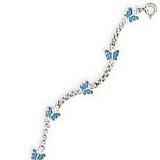 Categorized listing of Anklets and Toe Rings currently available which feature a butterfly theme. Adjustable Ankle Bracelet crafted in 14 kt Yellow Gold Dimensions: Length: 10.00 Inches - Free lifetime warranty, comes with gift bag and card. 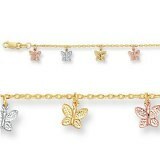 Enamel Butterfly Ankle Bracelet - 3.0 grams of 14k gold. Bracelet is 5/16 inch wide x 10 inch long. 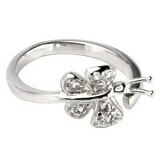 10 Inch, Spring Ring Closure, 14k Yellow Gold with enameled butterflies. Includes gift-ready jewelry box. 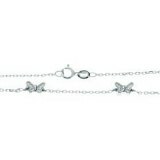 This Sterling Silver Charm Anklet comes with an Extension Chain so it can be used on ankles 9 to 10 inches long. This double toe ring set lets you express your faith in a playful and fashionable way. Both toe rings are crafted in solid sterling silver and are adjustable. 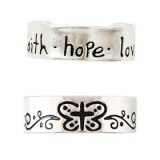 One ring features the words faith, hope, love in oxidized letters, while the other is decorated with a butterfly cross and pretty scroll pattern. .925 Sterling Silver, Genuine Cubic Zirconia, Adjustable. 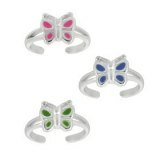 An adorable 3 piece pink, blue and green enamel butterfly is perched in the center of this chic toe ring. 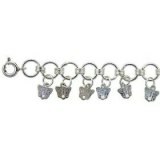 Toe ring is crafted of fine sterling silver. It can be slightly adjusted for a snug fit.